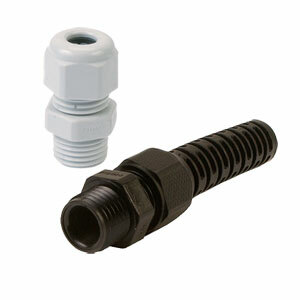 Liquid tight cable glands and cord grips are available in grey or black and come in metric or NPT threads. They are used to protect wiring as it enters electrical enclosures or cabinets. They can be used with threaded entrys or with through holes. The metric sizes are IP 68 rated without sealing washers and are typically used for through hole applications. The NPT sizes do require sealing washers. Select the thread size and clamping range for your application. Lock nuts are sold separately.